When your loved one is suffering due to the negligence of nursing home staff or administrators, it is vital for you to do something about it. If you suspect that nursing home staff is not providing proper care for your loved one, then a nursing home lawyer can help you investigate this serious situation. Federal laws and Arizona statutes are in place to help you stand up for the legal rights of your loved one and to protect him or her from neglect and abuse. According to the information collected by Medicare, there are 149 licensed skilled nursing homes in Arizona. Based on the inspector’s findings through investigations and surveys, the federal agency found that thirty-seven (25%) of the Arizona nursing facilities in the state fell below the national average after serious deficiencies and violations were identified. If your loved one was harmed or died prematurely while residing in an Arizona nursing home, we encourage you to contact the Arizona nursing home abuse & neglect attorneys at the Nursing Home Law Center at (800) 926-7565 to discuss your case during a free case evaluation. 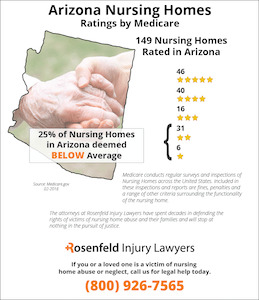 The Adult Protective Services Act in Arizona currently defines what abuse, exploitation and neglect mean in the context of the nursing home environment. It is important for loved ones to be aware of what constitutes abuse, exploitation and neglect so that they can recognize its forms and protect their loved ones. Abuse means an intentional infliction of harm, injury caused by negligent acts or omissions, unreasonable confinement and sexual abuse. Exploitation refers to taking advantage of a vulnerable adult for one’s own profit or gain. Neglect refers to a pattern of conduct where an individual is deprived of food, water, medical services, sufficient living conditions such as heat and air conditioning, and other services that can help a resident to maintain an adequate standard of living. 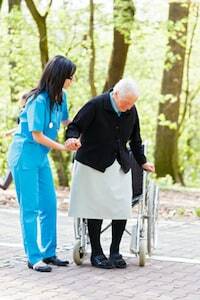 Loved ones who decide to file a negligence claim to recover for the injuries of a nursing home resident should be aware that there is no damages cap under the Arizona Constitution for negligence or wrongful death claims. There is a two-year statute of limitations period for negligence and wrongful death claims, so loved ones should be sure to get in touch with a nursing home injury lawyer and report abuse immediately upon discovering any signs of it. 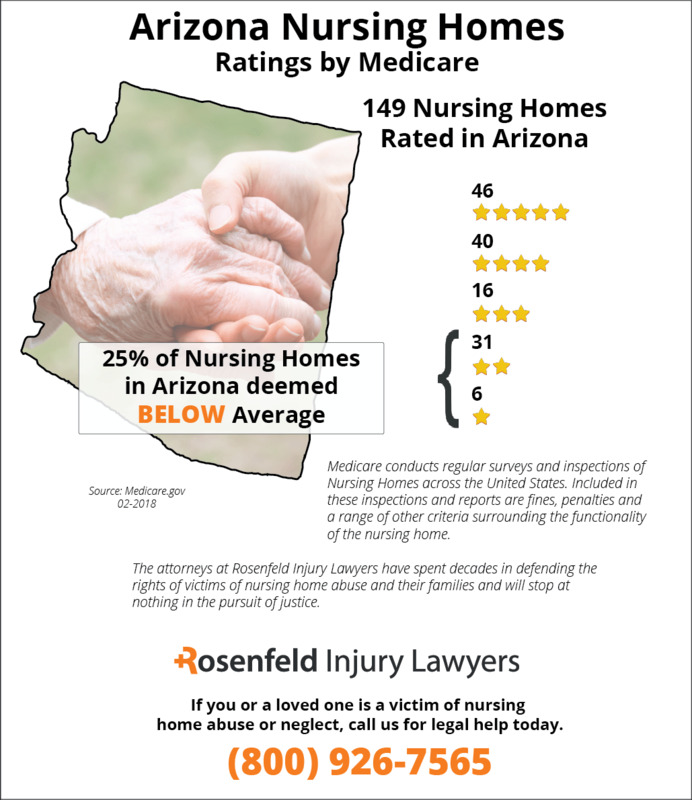 Unfortunately, statistics show that Arizona has some of the worst nursing homes in the nation for deficiencies in meeting professional standards. A 2008 University of California-San Francisco research study shows that 70 percent of all nursing homes failed to abide by professional standards in 2008. Over 50 percent of nursing homes also had deficiencies in having an accident-prone environment and failure to provide quality care to patients. Nursing home lawyers are available to provide you with a free consultation to assist you in ending the abuse that has impacted your loved one. Contact our Arizona nursing home lawyers to set up an in-person meeting or receive information on the phone. You can receive legal advice from our nursing home attorneys that will help you vindicate the rights of your loved one. Family members are often shocked when their loved one in a nursing home has developed a debilitating bedsore. Often times, the families are told that the pressure sore is the result of the patient’s medical condition or just one of the many side effects of the medication prescribed by their doctor. However, nearly all types of bedsores are preventable or can be effectively managed to ensure it does not advance to a life-threatening stage. When it comes to the investigation and prosecution of pressure sore cases, you can count on the Arizona nursing home abuse attorneys at Nursing Home Law Center LLC to help you and your family get the answers you deserve. Our firm handles Arizona bed sore lawsuits on a contingency fee basis where there is never a fee charged unless there is a recovery for you. Contact our office for a free case review. Many times, a nursing facility is the only solution to care for an aging parent or loved one suffering an Illness or disease. This is because patients who are mobility challenged are often unable to reposition themselves in a chair, wheelchair or bed and require ongoing assistance to ensure they do not develop a pressure sore. A bedsore (decubitus ulcer; pressure ulcer; pressure sore) has the ability to develop quickly, and if allowed to develop into advancing stages can be extremely difficult to treat and nearly impossible to heal completely. Because of that, it is essential to understand the recognizable signs of a bedsore in its early stage to optimize its potential of healing. If allowed to advance, the bedsore can become extremely painful where joint infections, cellulitis, sepsis and sometimes cancer can occur. Late stage pressure sores are often infected, emit an odor, drain pus or cause a fever. In recent decades, there has been an increasing demand in the number of nursing home beds required to handle the aging population. As a result, many nursing facilities are now understaffed; with overworked caregivers providing care to too many patients at once. In some situations, the staff is unlicensed, lack sufficient training or a not qualify to perform tasks as required. Nursing home negligence is often the result of inattentive care or failing to implement developed care plans designed to prevent pressure sores. When the developed health plan is not implemented, and the patient’s body is not repositioned routinely every two hours or less, pressure sores can begin to develop. If left untreated, they can easily become worse. In advancing stages, a small pressure sore can turn into a life threatening decubitus ulcer exposing bone, muscles and tendons, increasing the potential of infection. Nursing home staff and management have an ethical and legal responsibility to provide protection to everyone in their care. When the nursing facility and staff fail in their duty to provide quality care, patients become victims suffering serious medical conditions and sometimes death. When family members become aware that their loved one has developed a decubitus ulcer, usually the only recourse is to hire an Arizona bed sore attorney to stop the negligence immediately. By taking legal action through a personal injury claim against the nursing facility and staff, all responsible parties can be held accountable to the victim for the cost of medical treatments, along with their pain and suffering. The attorney can ensure that experienced professionals are brought in to provide proper treatment and monitoring of the victim. Surviving family members of a loved one who has died at the hands of negligent medical staff in a nursing facility have the legal right to file a wrongful death lawsuit. Below is a list of reputable Arizona bed sore attorneys who can assist families dealing with a loved one suffering pressure sores caused by the negligence of caregivers. Holding those legally at fault for causing injury to a loved one usually demands taking legal recourse to stop the abuse. By filing a claim or lawsuit, family members are offered peace of mind knowing no one else at the nursing facility will suffer the same pain and injury inflicted on their loved one. Fill in the form here to contact the following attorneys who specialize in nursing home abuse cases. They offer a free no-obligation initial consultation to discuss all available legal options for pursuing a case for compensation. 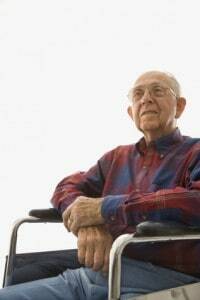 Nursing Home Law Center LLC has been a pioneer in the field of bed sore litigation for decades. Put our experience to work for you.